"If, as quantum mechanics says, observing the world tends to change it, how is it that we can agree on anything at all? Why doesn't each person leave a slightly different version of the world for the next person to find? Because, say the researchers, certain special states of a system are promoted above others by a quantum form of natural selection, which they call quantum darwinism. Information about these states proliferates and gets imprinted on the environment. So observers coming along and looking at the environment in order to get a picture of the world tend to see the same 'preferred' states. researchers suggest in Physical Review Letters, the world would be very unpredictable: different people might see very different versions of it. Life itself would then be hard to conduct, because we would not be able to obtain reliable information about our surroundings... it would typically conflict with what others were experiencing." Connecting that up with Darwinism sounds a little silly, I'd say. Seems perfectly obvious to me. That the Buckingham Palace has the same number of windows whenever you look at it is not because some little quantum thingies are fighting it out, and the state we see is what came out the strongest. Rather, they need to really get the thing about what you observe being a result of how it is observed. Looking straight at something isn't the only way of observing it. A great many people have observed the Buckingham Palace very carefully over time, and have taken pictures of it, written books about it, etc. In the bigger scheme of things, they're all observing it. It is a simple matter of averages, and maybe of a power law. If the majority of people believe it to be in that particular state (its location, color, construction, number of windows, etc), then that's what you're likely to find, if you don't manage to make the extra effort to find some drastically different way of looking at it. Picasso might have seen it rather differently, no matter what anybody else thought. But most people are pre-disposed to seeing it the way it "is", which means largely the way that the majority of everybody else has seen it. In part because the majority opinion reinforces itself. Nothing to do with darwinism between quantum particles. Maybe natural selection within the attention from observers. If millions of people are seeing it a certain way, whether they happen to be there at the moment or not, and that way works, and is consistent with its surroundings and perceived history, then that's what you're likely to see too. Shouldn't be that hard to figure out. But this is still so strange to anybody who, despite any advances in quantum physics, still thinks about things in a newtonian manner. So they might look for more convoluted ways of figuring it out. "Its gonna take some time this time...."
...that we also share a 'collective causality' to be able to share the same things. 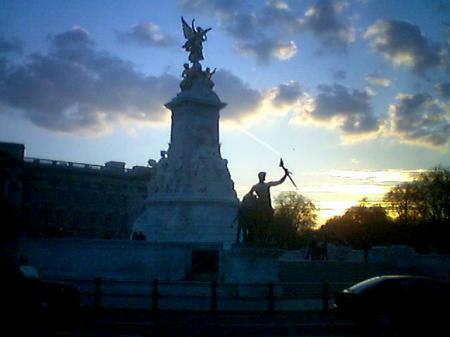 The truth is: People do NOT see things -not even Buckingham Palace- "the same way"!!! BP has the nr of windows that was determined by the architect and whomever... Have ten randomly chosen people in a group. Let them take a look at BP and then take them into the closest Cafe` or similar, give them pen and paper ans ask them to draw a sketch of the BP, ask how many windows, doors, gargoiles or whatever, are on the wall they just stared at. Ahh, you get the idea. And you'll find out very fast that 1) almost nobdoy got the 'facts' correct. Not only that, but 2) almost for sure everone will come up with a different number of windows/doors, gargoiles, whatever. So not only are they all factually inaccurate, but among eachother not two are the same! Why, because the SAW = perceived it differently!!! This is an old trick, tested thousands of times by Art-Teachers (at least where I went to school). Hm, you're right. What do we get out of it when we combining it with our usually lousy ability to observe things objectively? We have so many perceptual blocks and mental fallacies that we rarely can observe even simple events or situations correctly. If things should be how we tend to see them, buckingham palace would be some kind of cartoon. But maybe the averages still work, regardless, as the stuff our observations have in common tends to be stable. 10 Jan 2005 @ 16:51 by astrid : This little "game"
is an excellent way of teaching -yes, exactly that:OBJECTIVITY to (young) people. I was trained from my early teens this way -among others- into objectivity, where the "stable" facts dictated the situation and where the situation was the one to dictate the "next move" = our actions/behaviour instead of our capricious emotions dictating them, which is common here, in the US.... sorry, but that IS the truth! ONE of these days it WILL dawn on even the densest of us, that BP was (made a) CARTOON with so and so many windows and doors and whatever (to give an air of objectivity and to support it) from the very getgo! Consider a mountain range. You want to photo it with your little digital cam. Where are you gonna stand? Stop the car and get out. Move a foot either side. It doesn't matter. Where did you "take" the picture from? Lets suppose you have sampled a little chunk of space time volume just outside your car, at 3:30pm in the evening. Now imagine that the spacetime chunk you sampled is like a computer memory. All of that information about the mountain range has been stored like a computer, in that place by your car. But you could have got the same information by moving a centimeter forward, or sideways. Suddenly a busload of japanese tourists stops along side. Scores of digital cameras come into focus, they all get the same information. There is massive redundancy available for information about classical stuff. That's all that classical means. We already know that the universe is deeply quantal, so the non-classical wierdo information that the quantum equations also predict, must have gone somewhere as well. (if you write this as a matrix, then its all the crazy stuff that is not along the diagonal of the matrix) The idea is simply that it is also coded into the environment, but instead of gazillions of close copies almost everywhere, it is encoded way down at the tiniest scales of existence and it happens like that in an incredibly short time, so you would need to be smaller than an atom and have a special camera that detected gravity particles or something to even begin to look at it, and even then there is probably only one copy that is kind of enmeshed with the fabric of the quantum foam. So forget it. Lets just say it gets buried. But that doesn't answer the question of then how come the copy we see is able to reproduce itself over and over in space and time, so you and your tourists can snap it. Well that is because the same processes down there at the quantum foamy level are at work. The version of the mountain that stays put in space and time will also be the version that has properly formed physical variables like mass and stuff, even the quarks and fundamental particles are all related to this consistent version, so it gets selected from the mush. Its just because it is so consistent it is stronger and fitter, more likely to crystallise into reality. Especially since you and the tourists are already in that reality. Its just a definition of reality really. But its a bottom-up definition, and that's what will drive the holistic types up a tree. It becomes harder to find a place for a "creator" in these scenarios. Actually, the whole tradition that there was a "creation" is at stake too. Have you ever stopped to think that the whole idea of creation at some point in time is unnecessary? What if creation were simply an on-going process? I mean now. The universe is creating itself here and now, like it always has done. If you have ever programmed a web-server you will start to get an idea of what I mean. We used to write programs on desktops like they lived forever, you could go to lunch and just pick up running a program on the mainframe where you left off. But a webserver is a different kettle of fish. Here you run the entire program every time you want to do anything. Maybe the universe is like that. Everytime something that already "exists", that has pulled itself out of the foam, interacts with something else, the entire software package runs. Or should I say, the entire logic of the universe applies. The existing masses, electrons, charges , colours etc etc etc.stuff that has already been selected, is much better at causing other stuff to exist. So you see, we have the Darwinistic thing at work. Again. Woman age seventeen and older can buy it at a drug store wtoihut a prescription. Federal officials wanted to approve a request by Strategy B's maker to also let girls under seventeen buy it wtoihut a prescription.But President Obama's secretary of health and human services, Kathleen Sebilius, intervened to block that approval. She stated there was not enough study on the use of Strategy B in younger girls.Critics stated the Obama administration was just trying to avoid what could have been a politically hot issue within the presidential campaign. They stated producing Strategy B available wtoihut a doctor's order could assist a great deal more teenagers prevent pregnancy. But supporters of your decision say younger teens who are worried about being pregnant should have to talk to an adult for guidance. ,Your School about Montreal perceives it's got seen CFBDSIR2149, a poerufwl awkwardly-named propane big four for you to several conditions greater than Jupiter, sailing independently on the AB Doradus Moving Gang of much younger hollywood film stars. May made the invention initial by way of identifying their particular target by using home imagery with the Canada-France-Hawaii Telescope, and then with all the Substantial Telescope for you to consider of the fact that article had been simultaneously they cant manifest as a superstar combined with incredibly hot plus much younger sufficient (752F plus less than 140 billion dollars year-old) and fit the behaviour on the world orphaned very early inside it's everyday life.